"This App is easy to use, and does what I need. I was hesitant at first, but am glad I got this. I love being able to deposit any check I may receive!" "Used the app to deposit a check for the first time today. it worked well and was easy to do"
"It is so convenient, being able to pay bills and transfer money from my couch is great!" 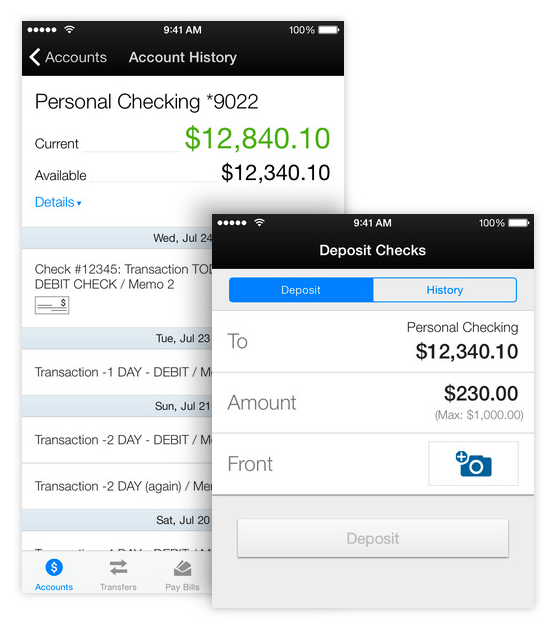 Banking online is easier than ever with our Mobile App. Log in to view your accounts, transfer money between accounts, pay bills, deposit checks, and more. Our convenient location map makes it easy to find nearby branches and surcharge-free ATMs when you're on the go. You can even add purchase reward offers to your debit card before you shop! Please note: Prior to using the Online Banking app for the first time, you must establish an Online Banking login for your account from a computer. No apps available for your phone? No problem. Just sign in to your Online Banking account from any computer and choose "Mobile Banking and Alerts" to set your account up for mobile and text access. You can even schedule text alerts to notify you when your account balance falls below a specified amount or when certain activity occurs on your account.